They came for the president but he was at home watching telenovelas. Forced to improvise, the South American guerrillas who raided their fictional country's state sponsored event in order to demand the release of all imprisoned political prisoners opted to take the guests – including world renowned American soprano Roxane Coss (Julianne Moore) and successful wealthy Japanese industrialist Katsumi Hosokawa (Ken Watanabe) – hostage instead. Letting all of the women (except for the valuable opera singer), children, and sick people go as a sign that they're willing to negotiate in good faith with Messer (Sebastian Koch), the Red Cross worker acting as a go-between, unfortunately it isn't long before gunfire erupts and the first life is lost amid the chaos. 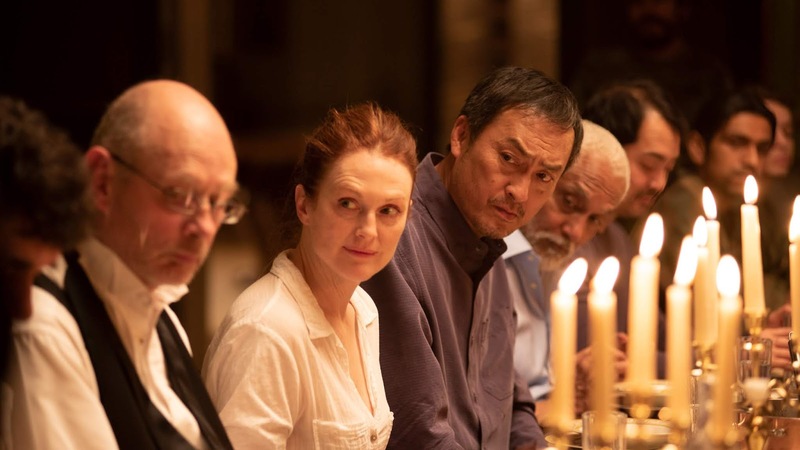 With the incredibly diverse guest list comprised of individuals from nearly all languages and walks of life complicating matters even further – and giving Hosokawa's translator Gen (Ryo Kase) a major mental workout – the hostages and their captors find other ways to communicate during the lengthy standoff. From cards and chess games to acting things out as though it were life and death charades, we watch as the characters on both sides of the crisis grow closer, brought together because of forced proximity and also because they realize they're much more alike than they originally thought. But it's in the notes of the arias in the titular bel canto (or "beautiful singing") of Roxane Coss that breaks down barriers the fastest with the guerrillas and their captives as well as the outside world. And when the government begins to play hardball and turns off their water supply, the leader of the rebels pushes Roxane to perform for the press and those outside the walls of the mansion under their control in the hopes that it will urge them to see the humanity behind the hostage crisis and turn the water back on. When it works, Roxane is given more comfortable accommodations and greater respect by those holding the guns, including Carmen (María Mercedes Coroy), a young woman whose allegiance to the rebel cause weakens as time goes on. Using opera to help frame this adaptation of Ann Patchett's award winning 2001 New York Times bestselling novel, screenwriters Anthony Weintraub and Paul Weitz (who also directed) do an admirable job of translating the novel's dramatic elements while also ensuring that – in addition to its talented cast – many of its characters become fully three dimensional people. Driving the narrative forward the most however are the film's two romantic subplots between Hosokawa and the opera singer he's traveled to multiple countries in the past to see (and half loved before he ever spoke to her) but also – in perhaps Bel Canto's most effective and emotionally compelling plotline – the one that develops between Carmen and Gen.
Reminiscent of the way that the romance between Juliette Binoche and Naveen Andrews in The English Patient steals focus from the leads, while unfortunately Weitz's one hundred minute Bel Canto is nowhere near as epic in scope, Carmen and Gen's love story is the most cinematic in terms of the way it's executed and by its very nature, carries the most tension and emotional weight. 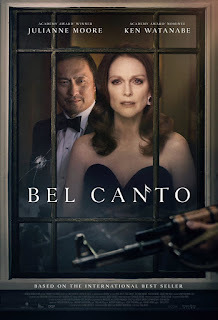 Tension, in fact, was one of the words I used to describe my dream adaptation of Bel Canto ten years ago when I posted a list of the books I most wanted to see translated to film. Hoping it would help "reinvigorate Hollywood to create much needed thinking films for women,” and undoubtedly with Atonement still fresh in my mind, I listed Joe Wright as the director I thought would be best suited to the material at the time. And while neither he nor James Ivory, Bernardo Bertolucci, or any of the other filmmakers tentatively or even temporarily attached to Bel Canto ended up making the movie since Monsoon Wedding producer Caroline Baron first bought the rights to it in '02 (after being moved by its humanistic themes post-9/11), post American Pie, Paul Weitz has proven himself more than capable of delivering a moving film. An especially talented writer who, working in tandem with his brother Chris Weitz, and screenwriter Peter Hedges actually improved upon the original ending of Nick Hornby's otherwise terrific novel About a Boy with a pitch-perfect adaptation in '02, Weitz is also no stranger to opera given his work staging a performance with Placido Domingo on the Amazon series Mozart in the Jungle. Reuniting with his Being Flynn actress Moore and Cirque du Freak: The Vampire's Assistant actor Watanabe, while Bel Canto is an effective and at times quite moving translation of Patchett's novel – augmented even further by the music that cuts right through the chaos, from soprano Renée Fleming (whose singing voice is used for Moore's Coss) and composer David Majzlin – it feels far too rushed. Furthermore, it's unable to quite match the passion exuded by Patchett's prose (which is essentially always the case when we move from one medium to another) as well as the music. Although we're drawn to the plights of some of the supporting characters, and one guerrilla helpfully marks off each day on a wall to give us a sense of time gone by, Weitz is forced to pack way too much into too short of a running time. Indeed at times it seems like you can almost feel his frustration as you know there's much more he could've done with more time and a greater budget in, for example, building up the character of young guerrillas Ishmael (Gabo Augustine) and Caesar (Ethan Simpson) before the film's final act. And while it's a solidly made work overall and by the time we reach the inevitably heartbreaking operatic conclusion, we are truly moved right along with some of the individuals onscreen who've managed to bridge what they initially felt was a momentous divide between one another, I found myself wanting more. More of what is the ultimate question. More information and more passion – like speed reading the subtitles at the opera to follow along – as involved in the moment as we are, we can't help but feel we're missing out by not speaking the language... even if Weitz does an admirable job as the behind-the-scenes version of my favorite Bel Canto character Gen by giving us this slight but overall engaging read on Patchett. 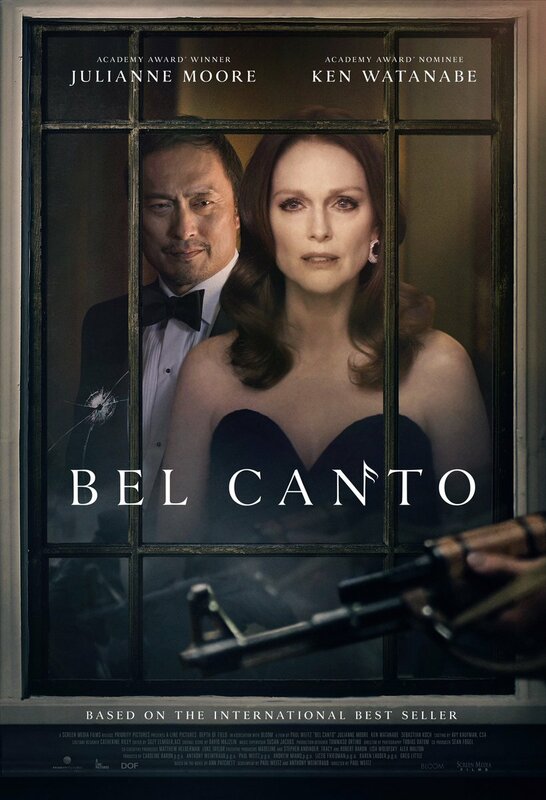 An operatic, cinematic version of Cliff's Notes that will hopefully make viewers who enjoy Weitz's work want to read the novel as well, in the end, Bel Canto boasts enough drama, romance, and tension to entertain a telenovela fan like the film's president (if, that is, he shows up) and all who appreciate bel canto.